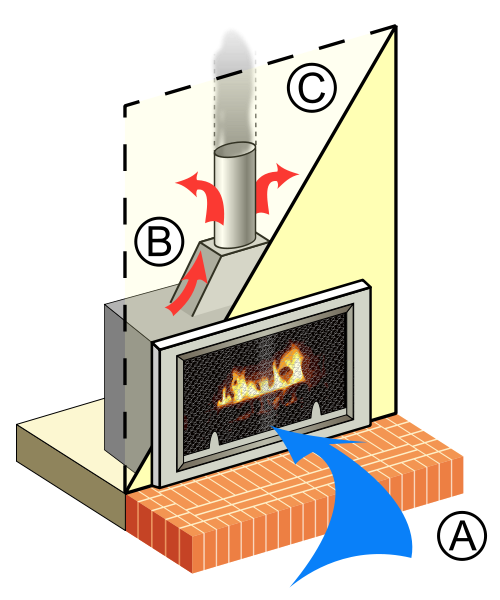 In a wood-burning fireplace, cool air enters the wood burning firebox, feeds the fire through the process of combustion, whose by-products are then released through the chimney in the form of smoke. Heat is generated and indirectly radiates throughout the room. However, in order to keep the fire going, it must constantly be fed kindling, wood, and other flammable materials. The burning of these materials produces sooty byproducts that can lead to the clogging of the chimney and are occasionally released into the living area. Wood-burning fireplaces are ultimately not very efficient, as much of the generated heat is absorbed by the masonry or chimney. As well, the fuel to heat rate is poor. Gas fireplace systems, however, are dramatically more efficient. They force all of the heat they produce into the room rather than letting it get absorbed in wasteful ways, such as in the chimney or masonry. As well, the gas allows the fire to have a lower combustion to fuel rate, increasing its efficiency dramatically. 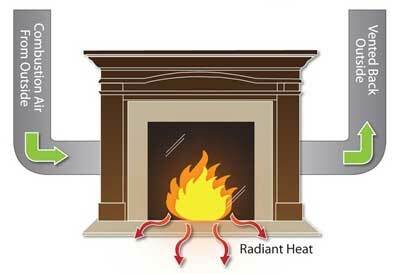 In short, gas fireplaces allow less fuel to create more heat. Vented Gas Fireplaces are vented through a pipe directly out the wall of the home, much like a dryer vent. They may also be placed in the center of the room and vented through the roof. In contrast to wood-burning fireplaces, vented units are completely sealed and contained from the room they heat. Instead of drawing air from the room they are in, they take air from the outside, use it for combustion, and directly vent it back out. Thus, none of the byproducts like fine particulars, moisture, or carbon monoxide ever even have the possibility of entering the room. All you get is the heat. 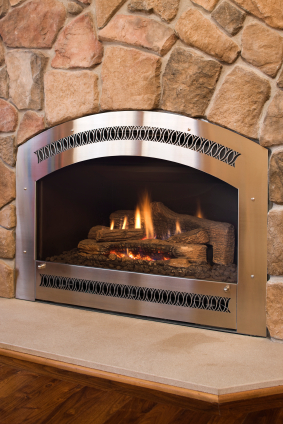 Ventless (or Vent-Free) Gas Fireplaces function much like a gas range on your stove, burning cleanly. Thus, they do not require a chimney or any pipe to vent their gasses outside. Instead, all of the heat they produce is forced into the room. They operate at a highly efficient rate, using less fuel to create more heat. The fact that you don’t need to build a chimney is just an added bonus. No need to change the wood in and out! Once the gas log insert is in, you don’t need to take it out. An instantaneous fire with only the flip of a switch. Wood fires take hours to burn and reach their peak in appearance and warmth. Gas logs cost much less per hour to use than wood logs.